Wow! Already we've had six weeks of shows! And to think how far we've come from this tiny little dream cut out of cardboard back in February. Thanks to everyone who's helped us along the way (so many!) and our wonderful audiences! We are full of gratitude. Nicole's interview with Linda, continued. 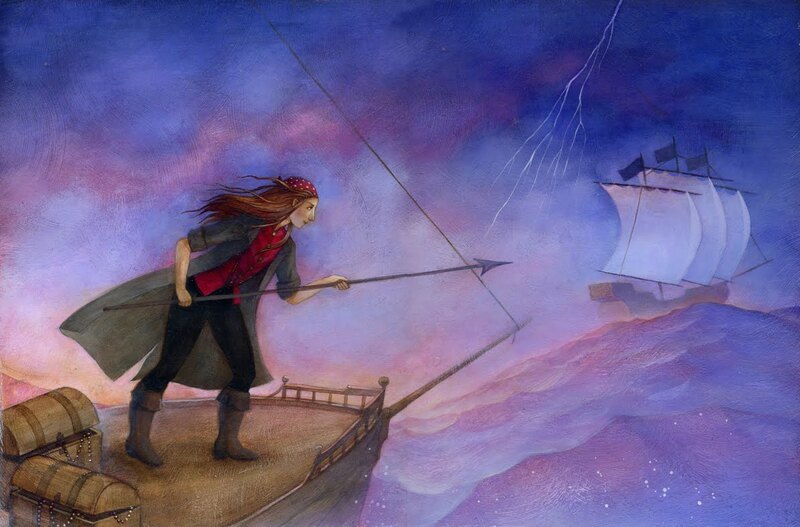 What is your goal for Luna's Sea? What do you hope people come away from it saying? "I want our audience to become completely submerged in the wonder, beauty, humor and magic we feel when we are performing it. 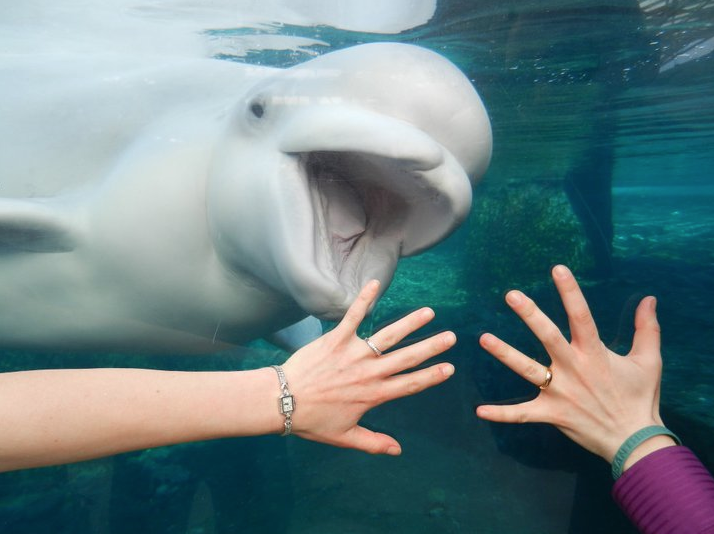 I hope that they fall in love with these animals as puppets, and that it gives them an even deeper connection when they then see those real animals at the aquarium, and a deeper desire to protect and appreciate them. I also hope they have a lot of fun!" What has been your biggest surprise so far working on this production? 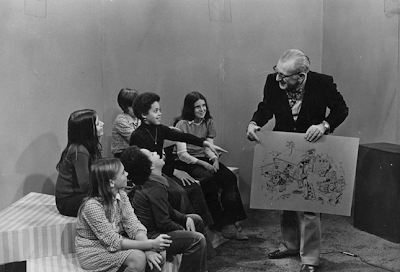 "I am most amazed by our puppeteers, many of whom are just 15. I've been teaching puppetry for many years to all ages of students including at universities. 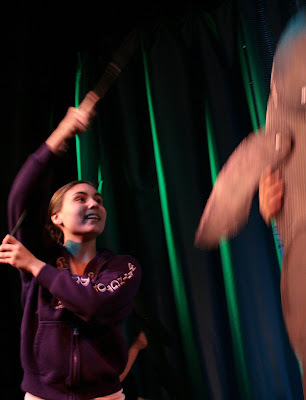 The dedication, determination, desire to learn and enthusiasm of Luna's puppeteers outdoes anything I've ever seen. The puppetry I'm asking them to do is not easy. 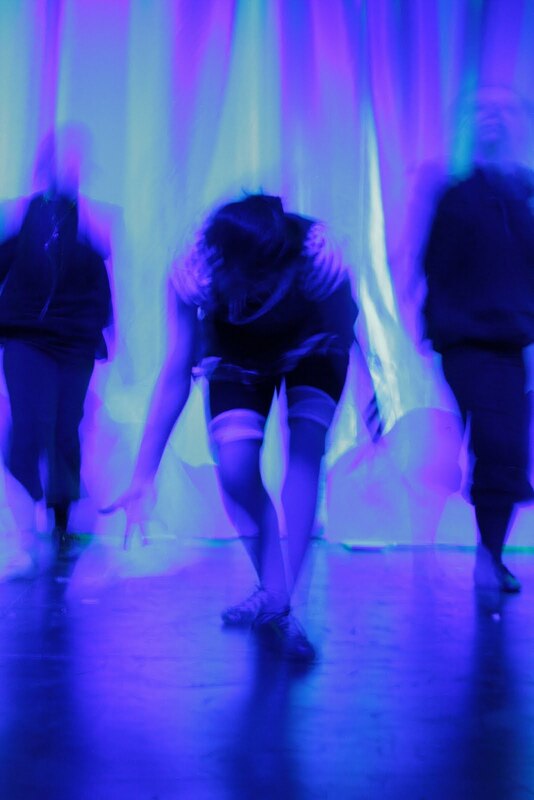 Our 5 hour rehearsals are physically strenuous, and take a lot of patience and experimentation. They have met every challenge we've thrown them fantastically. We are so lucky to have found them!" Here's a very different puppet: a giant chicken! 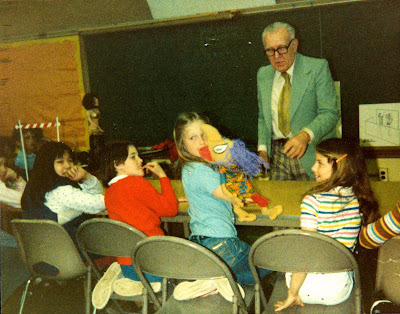 Linda teaches puppet building workshops with kids all around Connecticut. These two chickens were made completely of discarded materials, and designed and built collectively with Linda by the students of Common Ground summer camp over three weeks in New Haven. With an old refrigerator box to start with, their marvelous features included feathers made individually by each camper, painted old sheets for a neck, and the ingenious googly eyes made of rotisserie chicken containers. An animal in Luna's Sea has the same eyes-- if you've seen the show you probably know which one! Kimberly Smith (puppeteer / understudy for Luna) is 16 and a junior at Waterford High School. This is her first show with Cornerstone and she is very excited to be a part of it. She has been a part of a total of 21 other productions. Her favorite parts thus far have included Martha in A Piece of My Heart, Millie in Picnic, and Babe in The Pajama Game, and Hodel in Fiddler on the Roof. She is also a part of the International Thespian Society. She would like to thank her family and voice teacher Angela Bacari for being so supportive. "It's been fun so far. I really like the cast and we all bonded right away. The way they're making us move is teaching me a lot about my body. I'm learning a lot." 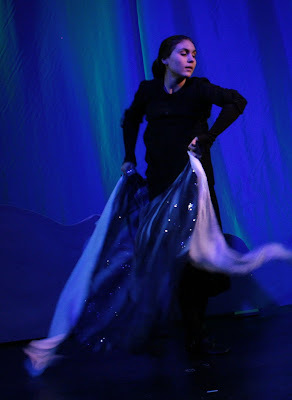 We are excited to report that Kim will be performing as Luna for the first time this Saturday, May 21st! Come see her! Are people usually surprised by the puppets and how dynamic they are on stage? "People are usually surprised by what puppets can be. I specialize in found object and reclaimed materials puppets. 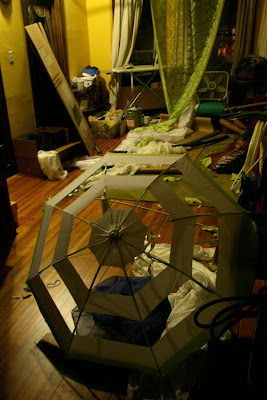 It is important to me to use materials that already exist, as there is more then enough to make a million puppet shows in all the waste we produce. In Luna's Sea you'll see discarded broken objects so completely transformed you won't recognize them for anything other then sea animals. You don't need a lot of money to buy fancy materials to make the most amazing puppets. It's all about patience, creativity, and lots of thoughtful practice for the puppeteers. 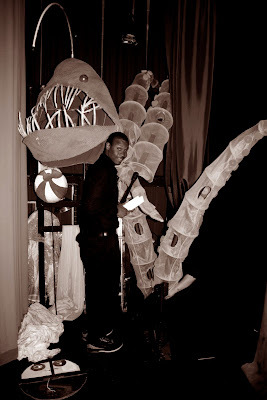 We have just about every kind of puppet in the show, from little seahorses to a giant pink octopus. But for me, the bunraku type, also called "direct manipulation" puppets because you touch the puppet directly without rods or strings, get the most satisfying movement. That's why our puppeteers are also dancers, because they are visible to the audience, and their movement, even if you're not looking at them directly, informs what the audience feels about the puppet. They are giving their life energy to make the puppets come alive. It's a beautiful experience." All kinds of things from our basements and backyards ended up in the show, and several things salvaged from neighborhood garbage cans. 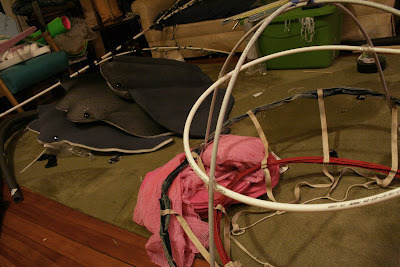 What do you think this old hoop skirt taped to plumbers tubing might become??? How did you know it would work best as a puppet show? With visits to the aquarium to come up with ideas I fell in love with the animals, especially the stingrays, and was very inspired by the reactions of children seeing these animals for the first time. I watched a little boy delighted to have a sea lion chase a penny he held up to the glass. 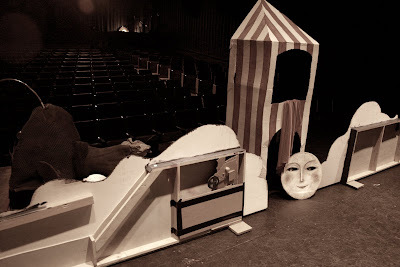 I knew I wanted to have that spirit on stage, and the only way to do it was to have puppet animals and a real child actor. 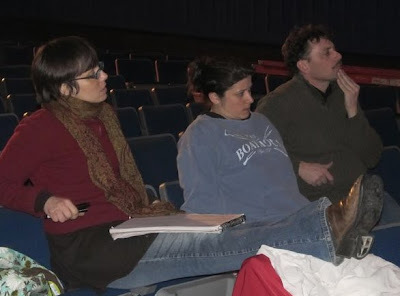 As the project grew, I was lucky to find the best collaborators I could hope for, including Jen McClure, a top notch props artisan from Yale University; Christine Poland, an incredible dancer and choreographer; Karl Gasteyer, an amazing director who is great with kids; and Tashia Levy, a brilliant stage manager and consultant. All of them added so much more to the original vision. 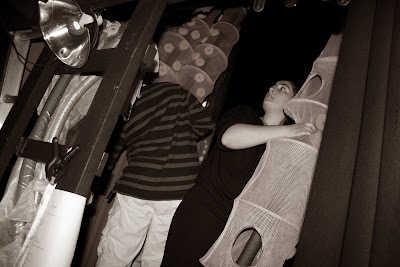 And once our puppeteers began rehearsing, Jen and I would build puppets, watch the performers figure out how to use them, see Christine's ideas of how to dance with them, and Karl's directing expertise to express the storyline, then make modifications. It's been the most productive collaborative project I've ever been involved with. There's plenty of aerobic dance and acrobatics going on onstage, but the real dance happens backstage. 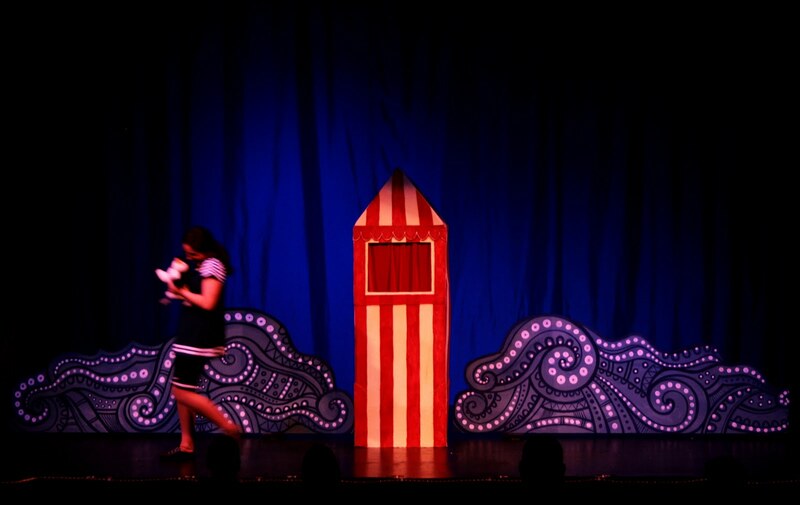 With just a few feet of wing space on each side of the stage, split between three levels connected by staircases and ladders, there's not an inch to spare with 7 performers, a stage manager, and dozens of puppets, especially our giant pink octopus! 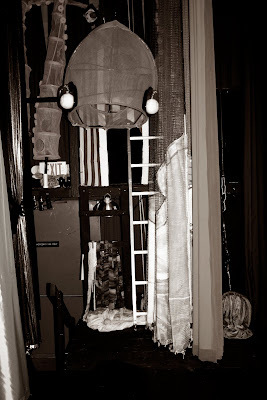 Every move behind the curtain is as carefully choreographed as the dances you see on stage. Puppets have to keep moving so new puppets can be accessed. Puppeteers climb ladders to reach the octopus head and angler fish which hang from the ceiling. Little puppets have to be kept track of so they don't get lost in the mounds of fabric waves. 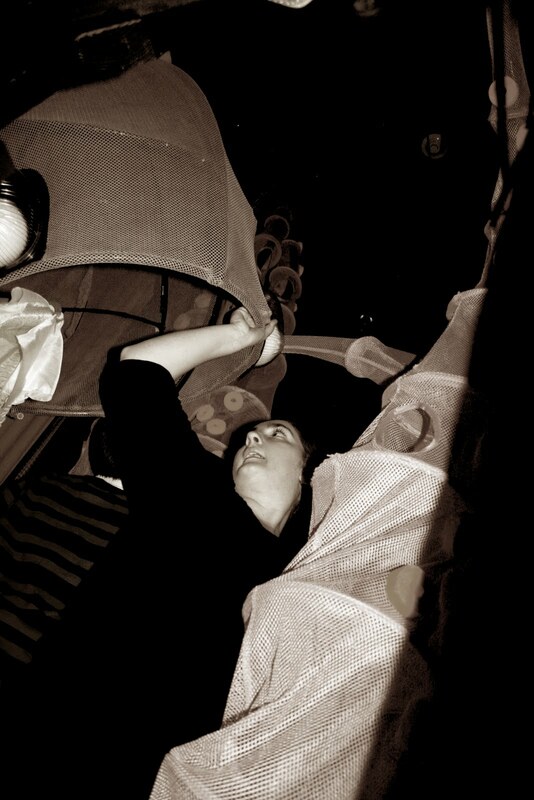 Puppeteers have to silently navigate around each other while they rush to be in their place. Nobody rests for 40 minutes! Where did Luna's Sea come from? Luna's Sea has grown out of many years of multiple projects in multiple disciplines. I'm a children's book illustrator by trade, but I'm also a puppeteer, performance artist, community performance arts organizer, and teacher. 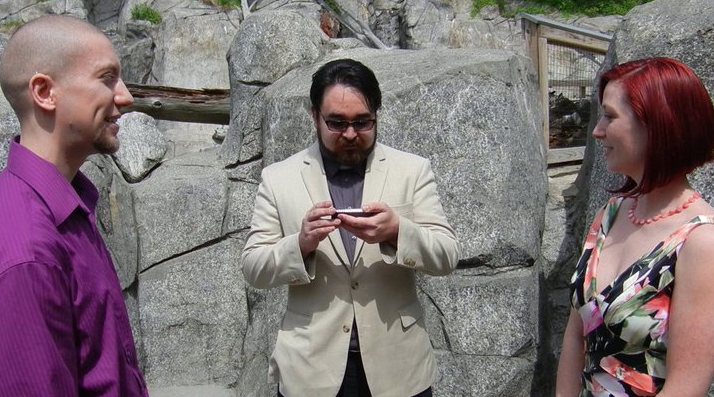 I grew up on a mountain in northern New England, but since moving to the shoreline of Connecticut 15 years ago I've been fascinated by the sea. 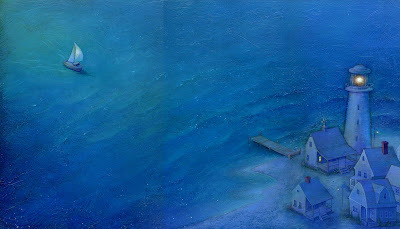 The ocean has been a recurring theme in many of the children's books I've illustrated, entirely by accident, and I love painting water, with all its layers of currents and light. 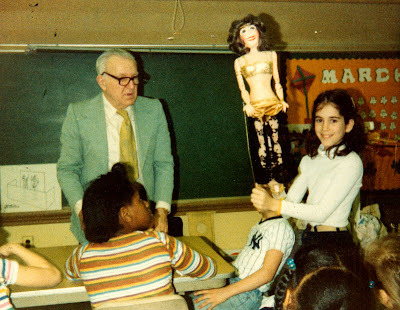 When I apprenticed as a puppet builder and puppeteer for Puppetsweat, a very dance-based puppet theater company, I had never danced before. I fell in love with it and began creating a series of short vaudeville acts called "Polly and the Moon" for a friend's performance festival in New Haven that featured the moon as a puppet character, which appeared and reappeared as a guide, teaching Polly (myself) how to dance. A whimsical version of a very autobiographical story. I've worked with Cornerstone as a designer for their grown up shows, when they asked me if I'd be interested in creating a children's show for the aquarium I immediately saw the moon again as a guiding character, since the moon is so connected to the sea, and again a young girl learning about the life around her and herself. Tell me about the production - what are the challenges with doing something like this? Well it is a big show, bigger then what most people think of when they hear "puppet show"! Luna is a 40 minute full stage show with a cast of seven actors and puppeteers, several dozen puppets of every variety, moving scenery, numerous choreographed dance numbers, and sophisticated lighting effects. Coordinating the variety of disciplines and creating so many different animals were the biggest challenges, but the result is worth it. We go from a gentle duet of two elegant little seahorses, to a giant pink octopus who wriggles out into the audience. 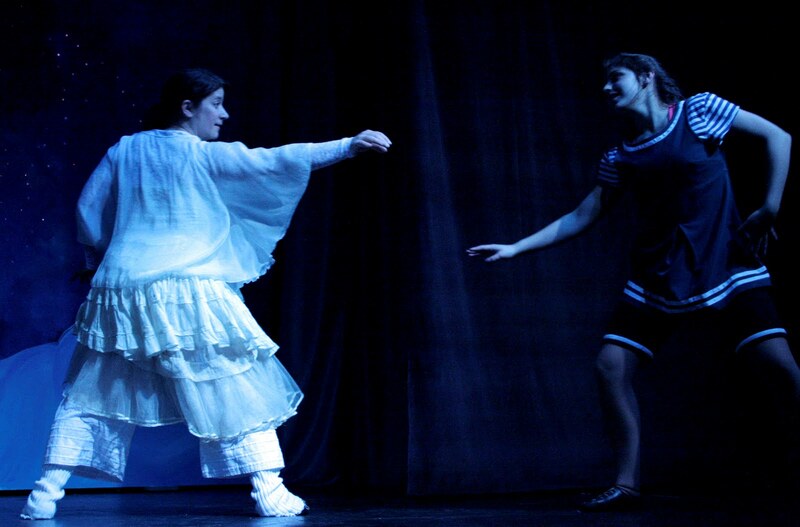 The show changes from moment to moment to keep our young audiences engaged, as well as their parents. There are a lot of technical details for our crew to keep up with, every moment is timed perfectly. 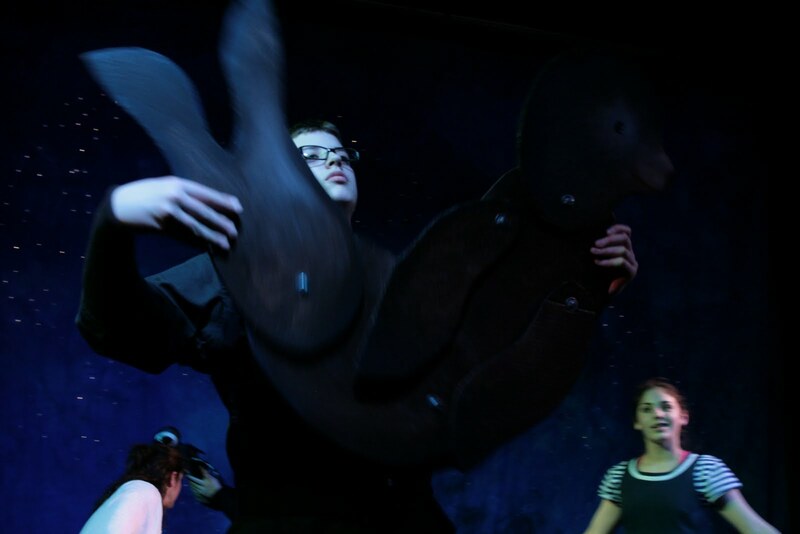 Our biggest surprise was how well and quickly our cast of mostly high school students have been able to keep up with the demands of this unique kind of show. Some of them had never touched a puppet before, and puppetry is a physically demanding art. 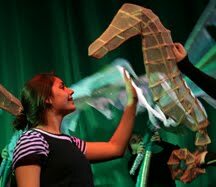 But their enthusiasm and dedication for learning has been remarkable and they've become stunning puppeteers and performers. 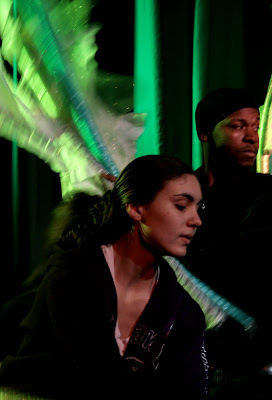 What do you think young audience members will remember most about this production? We think they will definitely remember the giant pink octopus! And we hope our audiences become completely submerged in the wonder, beauty, humor and magic we feel when we are performing it. We hope that they fall in love with these animals as puppets, and that it gives them an even deeper connection when they then see those real animals at the aquarium. RAWR! He's alive! Jen's great big angler fish finally got onto the stage, and he made a big splash! We gave him orange glowing eyes, and a light on his famous fishing pole. 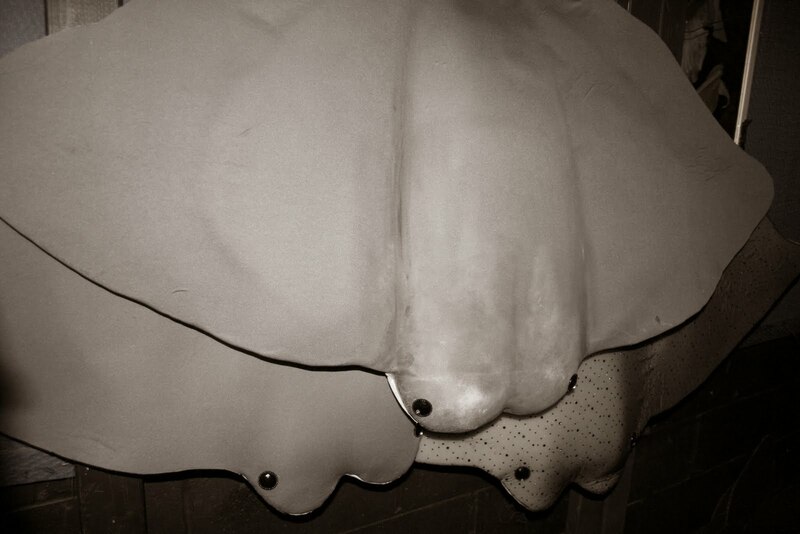 He's got to be 4 feet long, and is worn on a puppeteer's shoulders (Maryanne has had the honor so far). Below, the view from inside is very toothy. HURRAH! 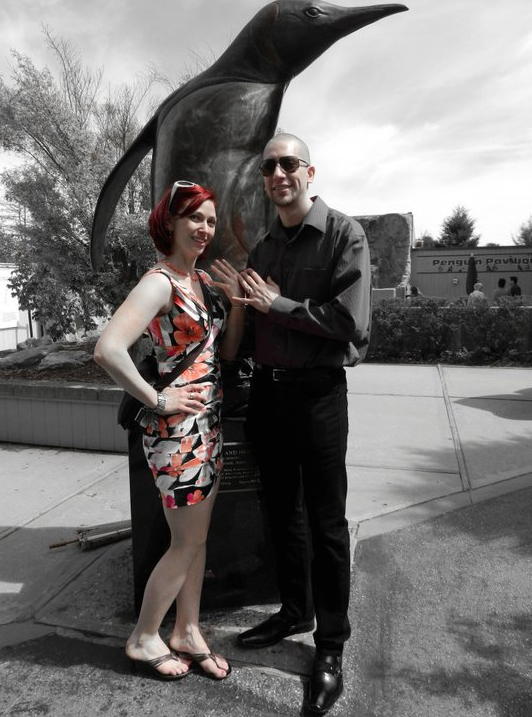 Everyone at Luna's Sea would like to congratulate our own incredible puppet builder, Jen McClure, on her wedding today at the Mystic Aquarium! Jen married her college sweetheart, Nadir Balan, an equally incredible artist. They tied the knot right in front of the belugas. Jen has been a life-long lover of sea creatures, and has a line of jewelry that features octopuses and other scaly, twirly, and tentacled beings. We can't think of a more perfect setting for them! The puppets wait for the show to start. From this side of the stage, it is not so glamorous. But with some help from the lights, the music, the puppeteers, the audience, and a little magic, all this plywood, cardboard and foam is about to come to life. 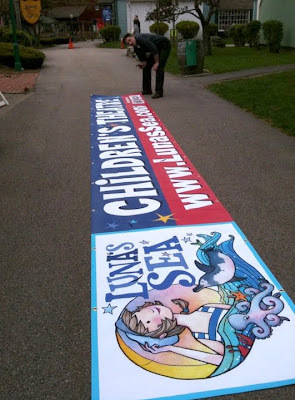 Luna's Sea is filled with acrobatic dancing, choreographed by Connecticut native Christine Poland who also plays the Moon. 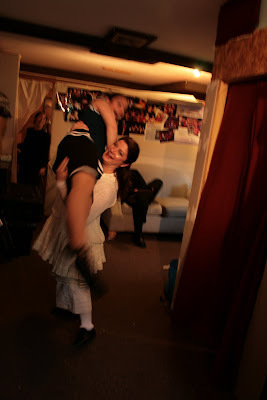 Here is Christine and Kaitlyn (Luna) practicing a lift before the show in the Cornerstone dressing rooms. 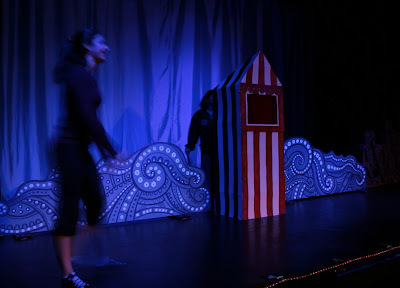 Felicia, puppeteer and Moon understudy, watches in preparation for the roll she'll be taking on soon. 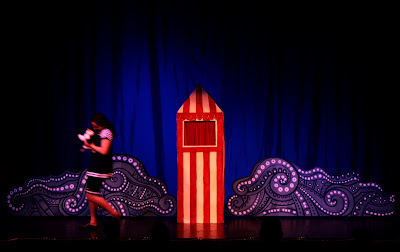 Two of the most prominent "puppets" in Luna's Sea are the two waves, plywood cutouts that slide, rise and fall throughout the show. Linda just re-painted them after getting a hold of some fluorescent white paint. Now when the stage goes dark for the blacklights, the waves disappear, but all the dots and circles glow as if they are lit from within. It's a great effect! We LOVE the UV paints! Linda took a video with her iPhone of the moon, after her eye mechanism was repaired and her face repainted for Luna. The Moon has been a feature in Linda's vaudeville acts for four years! She's aged pretty well for a cardboard puppet. Want to see how he turned out? 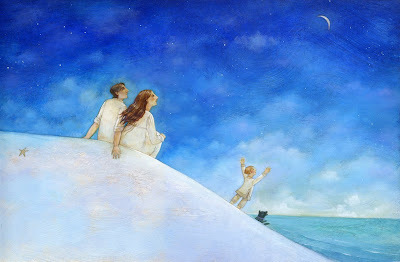 Luna's creator, Linda Wingerter, grew up in a family puppet company run by her grandfather, David A. Bogdan. 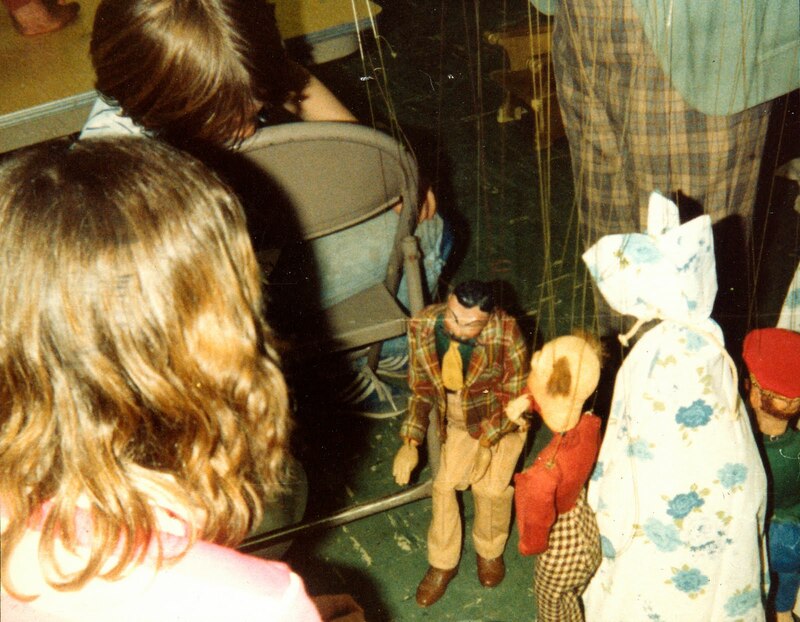 The Stringpullers started in the 1950s in New Jersey, with David building marionettes and fully working miniature stages complete with lighting, and his wife Helen sewing the puppet costumes. As their daughters Judy and Bonnie grew up they got involved in building and performing, and eventually his granddaughter Linda too. 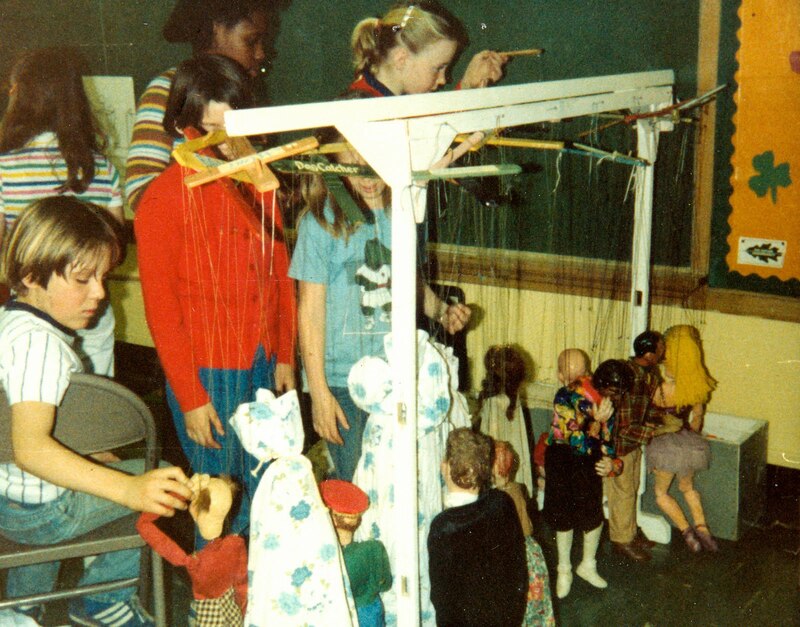 David's real love was bringing the puppets into schools and teaching kids how to build their own, which Linda is still doing half a century later! The Norwich Bulletin asked us some good questions for an upcoming article on Luna. Here are our responses for you too. Where did the story for Luna's Sea come from? The concept for Luna was born out of a creative collaboration between theater director Karl Gasteyer, puppeteer and children's book illustrator Linda Wingerter, and modern dance choreographer Christine Poland, who have worked together before on theatrical productions for adults at Cornerstone Playhouse. 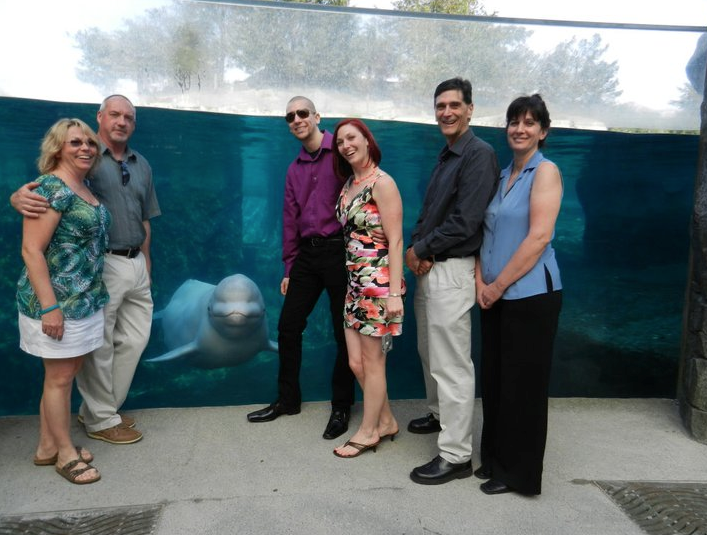 When the possibility of creating a show for children for the Mystic Aquarium arose, Linda jumped at the chance to create an underwater fantasy based on the true life animals at the aquarium. Linda, who has illustrated 7 award winning children's books and performed with the reputable dance-based New Haven Puppetsweat Puppet Theater at the Kennedy Center in Washington, DC, had been looking for an opportunity to bring her picture book story-telling background together with her love for puppetry and dance. 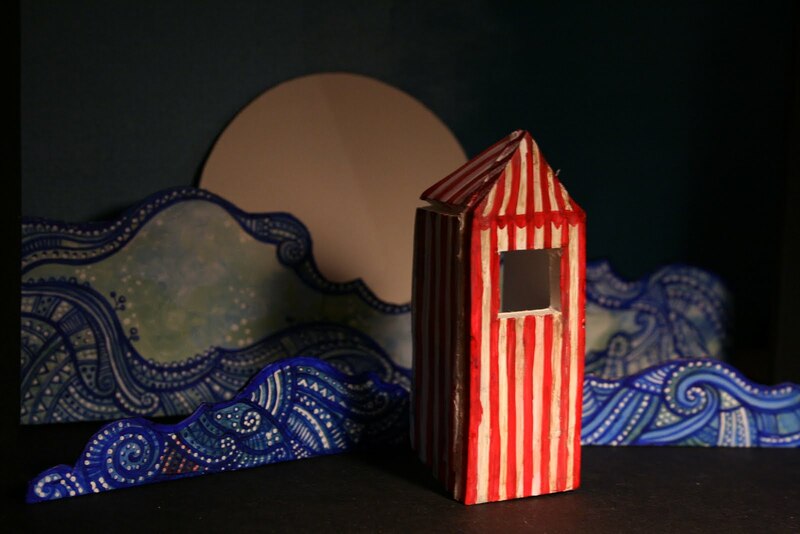 Luna, the story of a young girl who falls into a seaside puppet show to go in search of her toy penguin which has blown away into the sea, evolved out of a series of short performance pieces Linda had been developing for three years for an annual arts festival in New Haven. Using puppetry, circus arts and movement, the girl is guided through a fantastic landscape by the moon who teaches and encourages her to explore and dance. With the added directing expertise of Karl, and the exquisite fluidity of Christine's dance sensibilities, those short acts blossomed into the story of Luna, where the moon (played by Christine) has become the moon-costumed master puppeteer of the puppet show, guiding the young heroine (played by Irish step dancing champion Kaitlyn Kuvalanka) through the mystery of the ocean and introducing her to each underwater animal who she learns new skills and life lessons from, ultimately returning home reunited with her beloved toy penguin and new understanding of the beauty of life on earth. On Saturday morning we finally officially opened Luna's Sea to a great BIG and wonderfully enthusiastic audience. We even had two new cast members: Jen McClure's BIG illuminated angler fish, and the very BIG octopus head finally made it onstage! 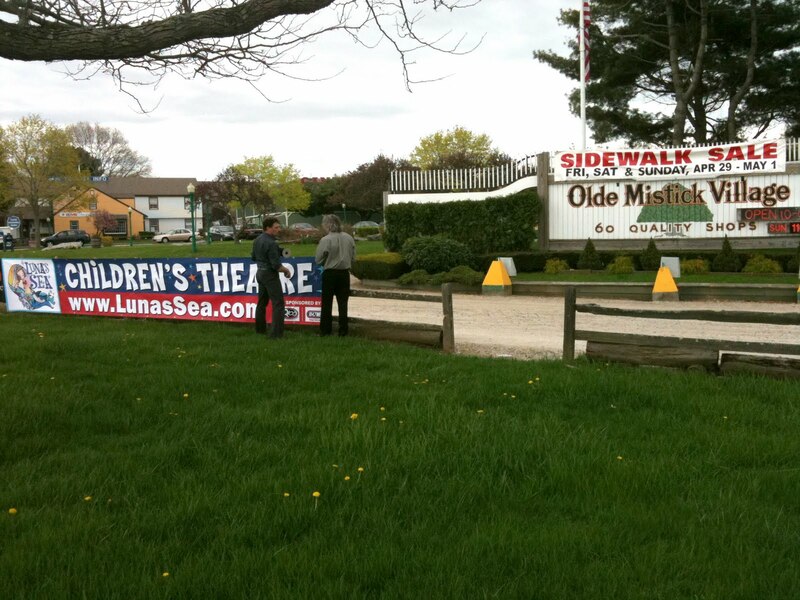 Also on Saturday, the arrival of our even BIGGER promotional banner, which Karl and Hunter installed in front of Olde Mystick Village. Now anyone getting off exit 90 from I-95 can't miss Luna! The show has really begun to gel, and we couldn't be more excited about the coming summer performances. Pictures of our talkback and the new animals soon to come!